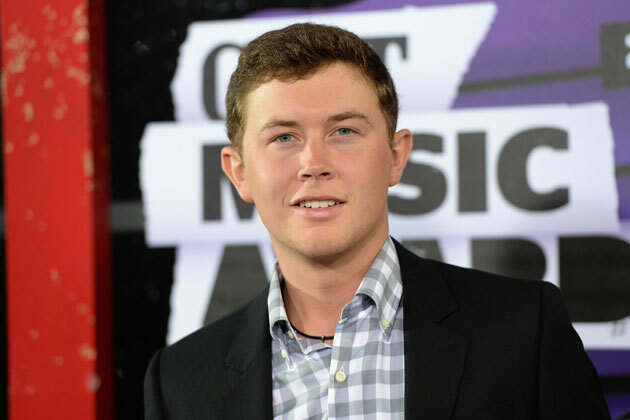 Scotty McCreery shared new music and a window for the release of his sophomore album during a CMA Music Festival fan party on Sunday (June 6), where six hundred McCreerians ate Bojangles chicken and enjoyed an eight-song acoustic set at Rocketown in Nashville. The still-untitled album is expected to be released in October, USA Today reports. McCreery says he’s recorded 18 songs already, but not all of them will make the final project. “We’ve over-cut, which is so nice,” he said before revealing another exciting detail. “We’re 90 percent sure that we’ve got a big-time singer that’s going to come on this track with me,” the ‘American Idol’ winner confirmed, referring to a duet he cut during CMA Music Festival week. Additionally, he’ll have at least one faith-based song on the album, and a song he introduced as ‘Suntan’ that he’s been performing during recent live shows. Scotty you have been a very busy young man, I can't wait to hear these wonderful songs. the titles sound like this CD album is going to be a winner. GOD BLESS U AND YOUR TEAM. GRANDMA FROM TX. Oh by the way you are coming very near where I live down the street from my house you will be performing at the SIX FLAGS OVER TEXAS. I won't be able to come I will be in SOUTH CAROLINA AT MY GRANDCHILDREN GRADUATION. Ok. Lets guess who that duet partner might be????? Will it be a female? Or a male? Who is the likely choice? Thanks for the update He deserve's it. I'm sooooooo Dagum happy for him too. This CD is going to be Big Winner. It is going to be like Clear as day and bigger. IT is going to WOW us. I get updates from idolforums.com and mjsbigblog.com. Mondays-Wednesdays are usually when all the Mediabase and Billboard info comes in. Billboard is always ahead of Mediabase because they strictly go by AI (audience impression). He's way ahead of a lot of people on AI. Mediabase uses a combination of AI, total spins and spin +/-. So it's easier for others to stay ahead of him. Cause say he has higher AI than the ones ahead of him but they've got more spins it offsets each other and that's how they stay ahead. It's slower moving on Mediabase. But many on both sites see SYT making Mediabase Top 40 in the next 2 weeks. Maybe Brad or Keith? Or Carrie or kellie p? My guess would be Dolly Parton or A. Krauss if it is a female. Tim or Brad if it is a male. I would love it to be Kellie Pickler. Scotty is my favorite guy, and Kellie is my favorite girl. He said it would have a blue grass feel . He has said Dolly in random interviews when asked. I agree on males......either Brad or Tim. He and brad did really well together on tour. What about Garth? ,I was thinking it could be Precilla Presley,since he was just in a photo shoot for her book..,or someone who'll play the guitar while he sings..I sure hope he tells us,but I'll settle for the new video that will work till the album gets out. Well, since Scotty said it would be somebody who is Really Big, I think it will be either Carrie, Brad or Keith. I sure hope it's not an unmentionable person. Not being mean here, but just hoping for one of the above. I'm just an old woman in a Hoverround, but Scott brightens up my life. What a joy he is to so many. I missed the blue grass thing. Did he say that At the fan party? That eliminates most listed except maybe Dolly. A. Krause used to be blue grass....maybe Lisa Marie ? Vince Gill is bluegrass. and so is Ricky Shaggs is bluegrass.